There seem to be a horticultural resistance to planting a lonely Chrysanthemum, "just another daisy flower." This is a shame because this low-growing plant adds a huge splash of colour to your containers or gardens. 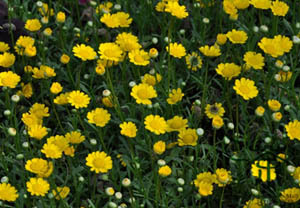 Rubbery and aromatic foliage produce bright yellow multi-petal flowers from early May until September. Actually this type of Chrysanthemum has been cultivated in China since the 15th century, and became a house hold garden staple since the mid 1700. In 1753 the famous botanist Carl Linnaeus gave this flower its genus name, derived from Greek words meaning “golden flower. This hardy plant loves to grow in a full sun location and even though the succulent like leaves give the gardener the impression they are drought tolerant, they do need to be watered regularly. To eat or not to eat that is the question; I value kale as a decoration rather than a crop. But I cannot dispute the lists of health benefits my foodie friends spout on about. Kale contains an impressive list of vitamins and minerals (vitamin A, C, K, manganese, fiber, calcium, iron and potassium), as well as the phyto-chemicals that provide a wide range of health benefits, from lowering cholesterol to fighting cancer. It also contains the highest anti-oxidant properties of any fruit or vegetable. But having said that, unlike other forms of kales "Redbor" grows upright on strong stems and creates a true garden statement. 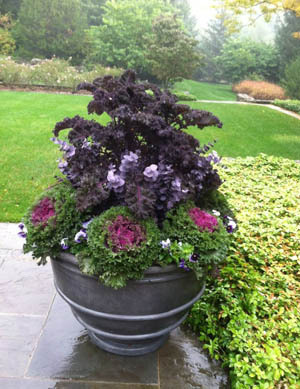 Tightly curled rich purple foliage offers a texture not found in any other annual garden plant which creates a study in contrasts in the garden planting. This tough plant will survive in the windy dry location and will be alive long after the rest of the garden has been finished by frosts. Looks Good and is Good For You, however I personally think that kale would taste better hidden in Ferrero Rocher. 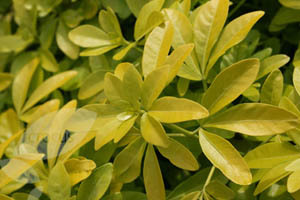 An eye-catching and deservedly popular annual container plant Choysia Sundance is well loved for its bright gold leaves. This reliable, easy to grow basket stuffer requires little to no maintenance and is perfect for the beginner or the master planter. Shiny, aromatic bright yellow leaves and citrus-scented white flowers that appear in mid June make this plant a unique container choice. All Choysia varieties love to grow in a sunny location, but will tolerate a part sun location, however the leaves will become less golden and more chartreuse in filtered light. Choysia has become a staple in contrast planting and mixes well into containers of annual grass, lavender and even geraniums. This easy to grow basket stuffer has real swagger in containers. Glossy, tri-colour, orange, red and bronze foliage with creamy yellow edges make this a gorgeous designer plant. White flowers eventually turn pink-rose and last for weeks attracting bees and butterflies. This easy and low maintenance plant is suitable planted in the sunny container on its own or in a combination planting. 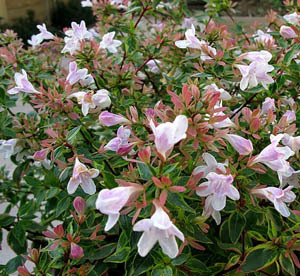 Heat and drought tolerant, Abelia Sunshine Daydream would prefer a sunny container but would also work well planted in filtered light. The best things about my business happen by chance. Along with everything else we do here, endless weeding takes place, gardens outside all summer and floors of greenhouses inside all year round. 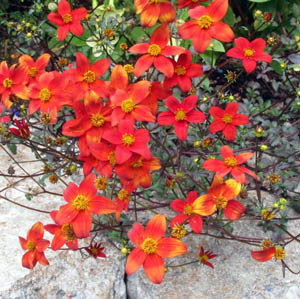 Then one of the girls noticed a different leaf of what could be a Bidens seedling, and look what it turned out to be. This superb plant is a totally different colour, 5 petal daisy-like flowers of burnt orange/red. This stunning basket stuffer has unusual bronze green toothed leaves that produce masses of flowers on long stems. With a trailing a spreading habit to around 2 feet this tough and resilient plant thrives in a full sun and dry location. One plant per container is the most you will need as they can romp around in the hanging basket, window box or patio container, on their own and create a huge display. 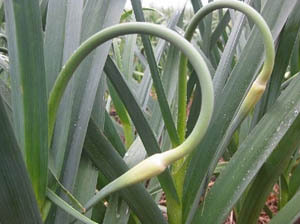 Garlic is very easy to grow; the problem is that you do need to have some forethought and planning. Every year customers ask, "where is the Garlic?" Well here is the basic Garlic information; you plant Garlic in the fall. Yes that is right, when you plant the tulip bulbs you also plant the garlic cloves. Remember gardening is "slow food" not "fast food". Garlic is a close relative to the onion, shallot, leek and chives. The lonely Garlic has a history of human use of over 7,000 years, and is surprisingly easy to grow in Southern Alberta. So did you forget to plant the garlic? Well we planted some for you to grow in your garden space. In early July, curly green pigtails emerge from the centre of each plant. These are the Scapes, which are hard stalks topped with tiny bulbils, which should be snipped off so all the energy goes into making the Garlic bulb, and Scapes are delicious when cooked as a side dish or pealed and added to pesto. As a child I grew up in a house of "English cooking" where tongue, heart and head cheese were the norm and Garlic was deemed to be "foreign". But today's modern kitchen always has a clove of garlic kicking around. Imagine your friends face when you hand then a fresh clove of garlic you grew yourself.